Zingerman's Business Secrets for sale. Buy online at Zingerman's Mail Order. Gourmet Gifts. Food Gifts. Digestible chapters from Zingerman's co-founder Ari Weinzweig's books on business. Over the last few years the Zingerman’s Guide to Good Leading series, written by Zingerman’s co-founder Ari Weinzweig, has gained enormously positive response from business owners, non-profit leaders, academics, entry-level managers and others actively engaged in innovative leadership practices. Back in 1982 Weinzweig and his partner Paul Saginaw opened Zingerman’s Delicatessen with two employees, 29 seats and a $20,000 bank loan. Today the Zingerman’s Community of Businesses includes ten different Zingerman’s businesses (Zingerman's Deli, Bakehouse, Creamery, etc.) with 22 partners, over 700 staff members and annual sales of $55 million. Ari’s series, A Lapsed Anarchist's Approach to Business, share the “secrets” behind that three decade-long success story. Now he's sharing the secrets one at a time. 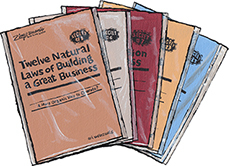 These booklets are easily digestible chapters from Ari's books. Many business owners and managers love them because they can share valuable information with their staff without asking them to read an entire book. The keys to running your organization in harmony with human nature. The laws of nature that underlie the success of any organization—large or small, for profit or not-for-profit, and most definitely Zingerman's! An in-depth look at just how amazingly powerful the Zingerman's visioning process can really be. The basics of our approach to vision writing, including the four elements of an effective vision at Zingerman's. It's a natural law of business that if we want our staff to give great service to our guests, we as leaders need to give great service to the staff. This secret explores the why and how-to behind this transformational approach. An in-depth essay on how to take Zingerman's approach to visioning and put it to work to help you create the life you want to lead.